-- Select a Size -- Mini - Out of Stock! Regular - Out of Stock! For a lasting playtime with your pup, you'll love our Loonies Zany Rooster Durable Dog Toy by Happy Tails! If your pup is looking for a unique play experience, our new Loonies Dog Toys by Happy Tails provide a multisensory playtime that lasts! Our Zany Rooster features a fun printed design on strong, Hi-Tec fabric that is strong but soft and helps prevent tearing and ripping. They've also added a protective liner to help add durability to the plush dog toy. Zigzag stitching helps to strengthen and reinforce the edges. 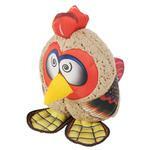 The Zany Rooster features plush fabric for a soft cuddly playtime that lasts! REASONABLY PRICED AND BEST SOFT TOY FOR MY AGGRESSIVE CHEWER! Posted On 11/13/18 by MK3 from FARMINGTON HILLS, MI Yes, MK3 recommends this product! I have tried dozens of soft toys claiming to withstand heavy chewing. Within hours my 150 pound Great Dane had always managed to shred them into dozens of small pieces and had to be trashed. He loves soft toys so when I saw the "Happy Tails" line of toys I was not optimistic especially when I'd spent triple the price on other brands and they were a waste of money. My dog loved it immediately and so did I. They're so cute! It's been more than a week of persistent chomping and playing tug with it and it still looks new. I ordered 7 more with various shapes. The only negative is the tiny plastic t-tabs holding it to the cardboard display which I can't manage to totally remove. Fortunately, the tiny remaining piece which I pushed deep into the toy is inaccessible through the strong fabric.